Southwest Airlines Co. (NYSE:LUV) is the largest low cost carrier in the United States. It is an outlier in the airlines industry in the sense that it has been relatively resistant to the economic downturn over the previous years. Even during the periods of slowing economy or rising fuel costs, the airline has reported profits. In the last year, its stock has been following an upward trend, giving returns of around 50% to its investors. It still has some upside potential because of some factors which have helped the company perform better than the rest. But before that, let’s just see how the industry is going to shape up this year. The U.S. airline industry has been extremely competitive since it was deregulated in 1978. Due to intense competition, availability of substitutes for customers, low switching costs, and high supplier power, it is an extremely tough industry to operate in. As it is a low-margin industry, the airlines need to adopt innovative methods to continuously increase their efficiency in order to increase their margins. The industry has been going through a rough trend over the last few years. Projected trends in 2013 are also not very optimistic. Decline in flights, seat capacity and passengers are expected this year. Overall, the industry will see a 1.5-2% drop in traffic in 2013. 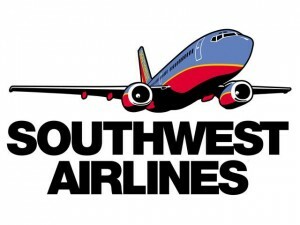 Southwest Airlines Co. (NYSE:LUV) has been a successful low-cost airline in this intensely competitive industry. It has delivered forty years of consecutive earnings to its shareholders, even during the time when its competitors were filing for bankruptcy. The reasons behind this are the various steps it has undertaken to improve its operational efficiency. For example, it makes sure that its airplanes spend very little time on ground, and more in air. This is ensured by flying non-stop flights. It follows one-aircraft model, which helps it in reducing additional costs of training and maintenance. The company doesn’t operate in small cities, and therefore avoids unprofitable routes. It also suggests that the company focuses on economies of scale. These kinds of efforts bring operational efficiency and have generated profits for the airlines. Its profit margin is among the highest in the industry. The airline has recently announced to expand to cities like Charlotte, Rochester, Flint, Portland, Maine, San Juan and Puerto Rico. It has plans to expand to high-traffic international markets as well, which will prove to be a growth catalyst in the time to come. The above table is an indication of the fact that despite being one of the largest airlines in US, Southwest Airlines is less financially leveraged compared to its competitors. Its debt/equity ratio of 45.11 is less than all its peers. 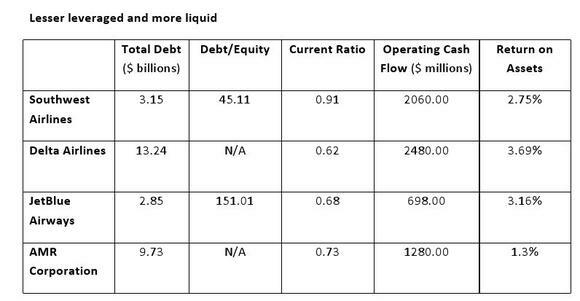 The equity is negative for Delta Airlines and AMR Corporation, therefore their debt/equity ratio is undefined. Even the liquidity ratio of the company is the highest among its other competitors. Its current ratio of 0.91 suggests that the company manages its current assets pretty well and therefore the company has enough liquidity to carry on the operations and pay off the interests for short and long term debts as well. This is further substantiated by the high operating cash flow for the company. The process of integrating AirTran into the system is in progress and is expected to get completed by 2015. Though the investors have yet to see the payback from the acquisition, but there are natural synergies that emerge from the deal. It not only eliminates a major competitor, but also strengthens its position in the industry with respect to the other large airlines. It has given the company access to some international routes as well. It has also given the company an access to AirTran’s Hartsfield-Jackson Atlanta international airport, a location that has been on Southwest’s radar for years.